It looks so pure and delicate, doesn't it? 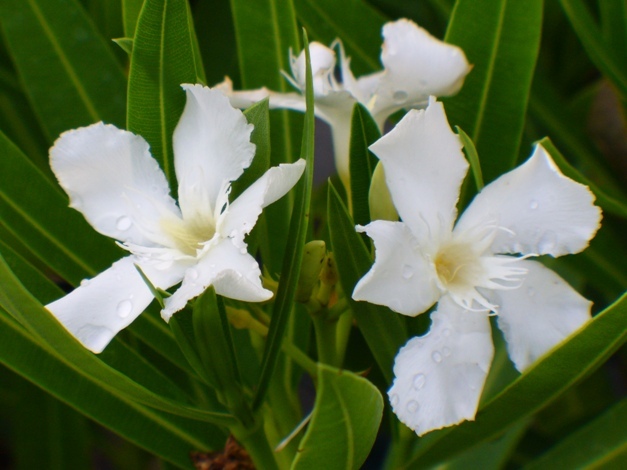 It's a White Oleander... and it's poisonous. 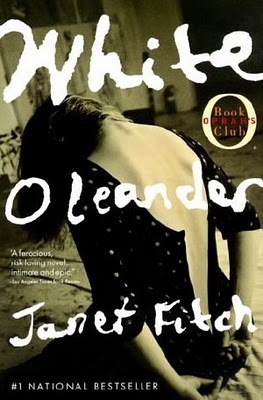 White Oleander by Janet Fitch is a boxful of contradictions. It was a spell so heavily bound by words, it encapsulated what I have always looked for in any novel--a distinct melody, come to think of it, White Oleander is an actual song. It is a story that peeled the mother-daughter relationship of murder-accused poet, Ingrid Magnussen, with her beautiful masterpiece, Astrid, to reveal the rawness of human dependencies, flaws, grandiosity and tenacity. Through White Oleander, Fitch demystified the tedious process by which a young soul gets subjected to fire, poisoned with ideas and compelled (intentionally or unintentionally) to change through a series of adjustments to foster homes and hungry if not troubled foster "parents". No doubt that while reading the book you would question yourself, do I have a chip on my shoulder? Am I who I am? What I loved the most about White Oleander is its consistency. Don't mistake this for predictability, in fact, each chapter was an unexpected blow for me. Rather the novel's consistency comes to play with how the novel can successfully weave itself to your psyche, like a humming sound you won't be able to wash of your hair easily. White Oleander was so beautiful. I genuinely felt thankful for the hours I spent just reading it. "Always learn a poem by heart. They have to become the marrow in your bones. Like flouride in the water, they'll make your soul impervious to the world's soft decay." *"One can bear anything. The pain we cannot bear will kill us outright." "It's such a liability to love another person, but in here, it's like playing catch with grenades." To experience the novel further, check out White Oleander (2002) trailer below. For those interested to see the movie too, I believe you can find a series of video clips on YouTube. Raw and unnerving. I recommend White Oleander to readers who are Vikings or Romans. Read the book to know what I mean. White Oleander (Php 335) is available at Fully Booked. For inquiries, visit their website here. PLEASE JOIN MY BOOK CLUB HERE. FOLLOW ON TWITTER HERE. FOR MORE BOOK REVIEWS, GO HERE. It's like Christmas on September!